It is time again for the “Secret recipe club” reveal! I am sure you all know what the club is about, but for the few of you who still don’t know about it, here goes a brief explanation. It is a great concept… each month you are assigned a participating food blogger to make a recipe from and in turn someone else will be assigned your blog. All you have to do is choose a recipe, make it and blog about it on the specified date. The only rule is to keep it a secret! If you are interested in learning more, or want to join the club, please visit the Secret recipe club website. This month I was assigned Where is my Spoon? written by the amazingly talented Adina. Adina lives in Germany and she’s originally from Romania. I was super excited about being paired with another European blogger and I spent hours on her beautiful blog before deciding what to make. Her site is filled with so many familiar recipes and I know I will be back to try more of them, especially the Romanian and German ones. 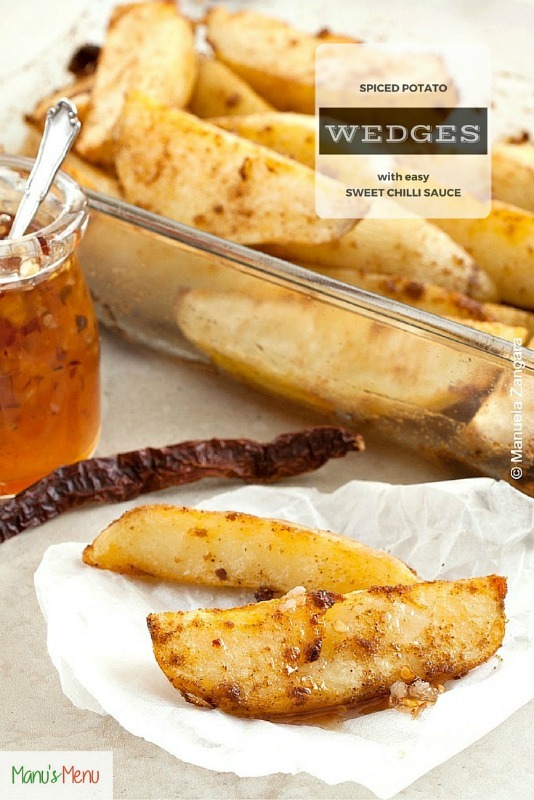 I picked her Spiced Potato Wedges with Easy Sweet Chilli Sauce because I love wedges and I still did not have a recipe for them on the blog! Besides, I was intrigued about trying my hands at making Sweet Chilli Sauce at home. You won’t believe how easy it is! They were delicious! You can serve them like this or add some sour cream too, if you like! Enjoy! And thank you Adina for such a great recipe! 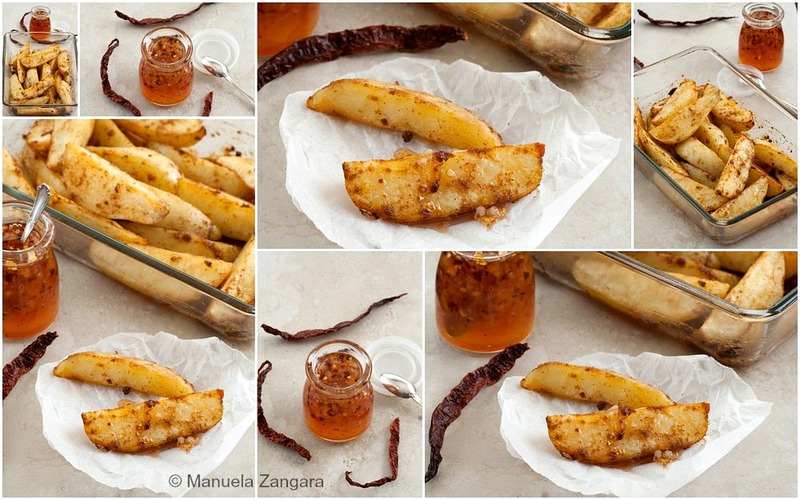 A foolproof recipe for Spiced Potato Wedges with Easy Sweet Chilli Sauce. Author Recipe adapted from Where is my Spoon? Preheat the oven to 200°C – 400°F. 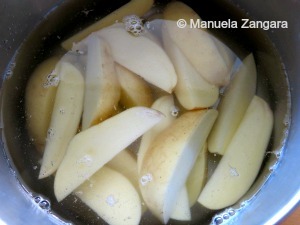 Thoroughly clean the potatoes and cut them into wedges (6 to 8 wedges per potato depending on the size). Place the potatoes in a large pot with cold water, bring everything to a boil and let the potatoes cook for about 10 minutes. They should be soft but shouldn't fall apart. Drain the potatoes and pat dry with kitchen paper. Place the potatoes in a roasting pan. Mix together the olive oil, garlic, ground coriander, smoked and sweet paprika until you obtain a paste. Pour this paste over the potatoes and mix well. Place the tin in the oven for about 25 minutes or until the potatoes are crisp, golden brown and cooked through. Meanwhile make the sweet chilli sauce. 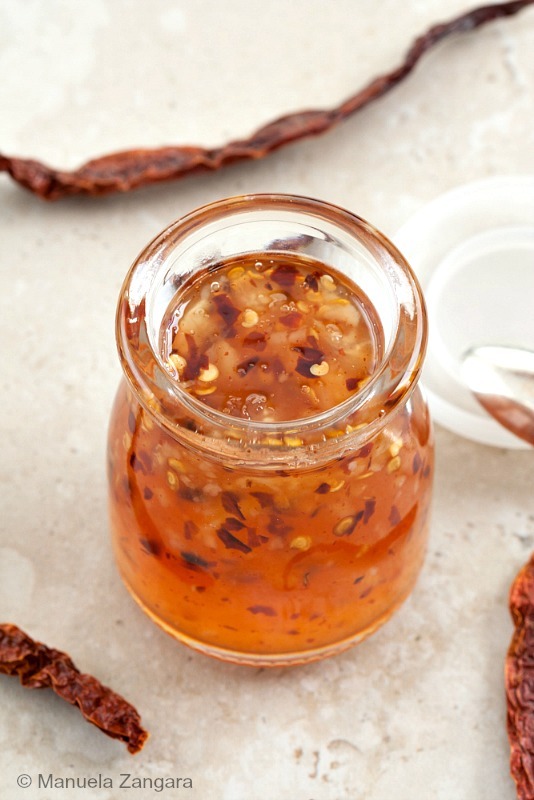 Combine the water with the rice vinegar, sugar, minced garlic clove and chili flakes in a small saucepan. Bring everything to a boil and let it simmer for about 5 minutes, stirring often. Melt the cornstarch in a little cold water and whisk the mixture into the boiling sauce stirring continuously for 1 minute. Turn off the heat and let the sauce cool down before serving. Serve the potatoes and sweet chilli sauce with some sour cream and a salad on the side. Hi Manu, nice to meet you. Thank you for the nice words, I am glad you liked the potatoes and the chili sauce. You have a wonderful blog and I am happy to find so many real Italian recipes, I cook Italian (or what I think is Italian ) a lot and I am very eager to try some of your recipes. These look delicious especially the chili sauce! I’m so glad to be part of SRC starting this month! These look great Manu. I’m so happy I was able to explore your blog for this month and see all your great recipes. Great SRC post! 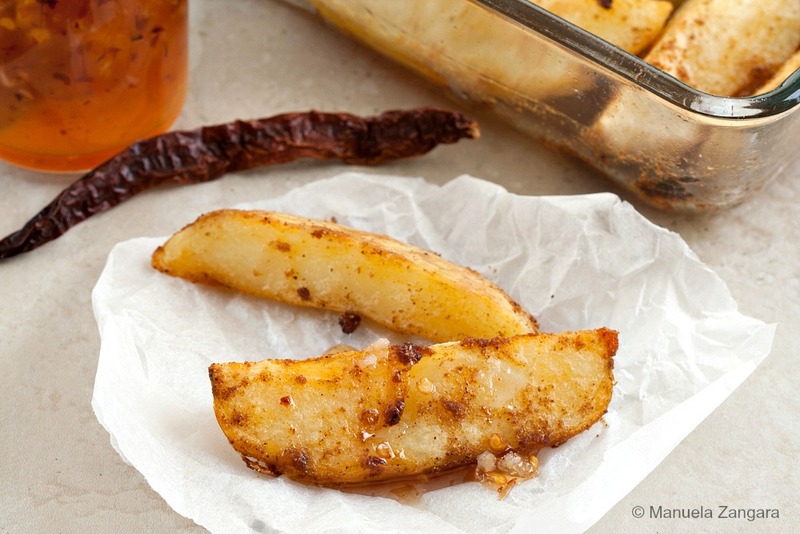 What a fun twist to potatoes!